—In light of the Alabama tornado storm devastation, I ask that as you read this Angel Food cake post, you think about how much it means when someone reaches out to you during a crisis and becomes your “angel”. If you are in a position to make any donation, please click the link to donate to the American Red Cross at redcross.org or by texting REDCROSS to 90999 to make a $10 donation. I also ask that bloggers who feel inclined copy and paste this at the top of their post. Thank you! 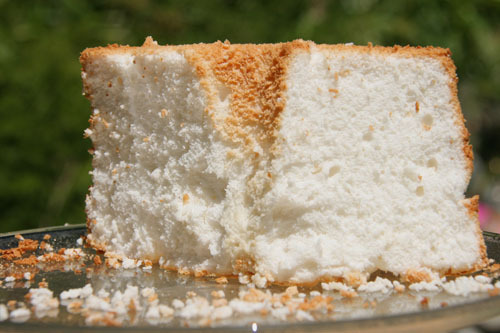 Angel Food Cake is one of the those beautiful things that seems to have fallen by the wayside. It’s a rarity these days to see it in a bakery or on someone’s dining table; at least around here in L.A.
Angel Food cakes are just not hip or of the moment. They are not a fancy French Macaron, nor are they crumbled with bacon, and they most certainly do not require slicing in thirds for breathtaking fillings. It is itself, just a tower of fluffy, naturally stark white splendor that one wishes they could jump into if they were a little kid wanting a soft, spongy landing to be enveloped in. Have you never wished you could jump into an Angel Food Cake? Hmmmm. Maybe that’s just me then. I invited some friends over for dessert yesterday, and we all have been trying to watch our calorie intake since bathing suit season is shockingly soon. 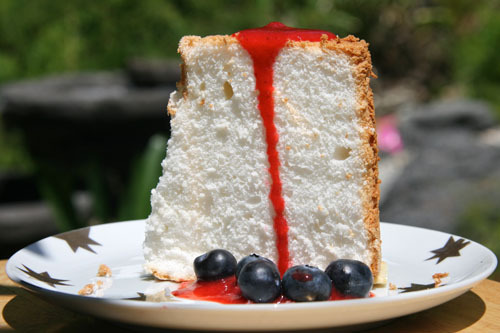 Angel Food cake is a notoriously low-fat cake since it only uses egg whites and NO butter, oil or any added fat. Yes, it is also a notoriously high sugared cake, but you can’t win ’em all I figure and a tiny slice of this melt-in-your-mouth cake drenched in strawberry puree and sprinkled with plump fresh blueberries will not totally ruin your diet and WILL fulfill any sweet tooth spike you are having. It surely did mine and my guests. We all mmmm’d and smiled as each fluffy bite entered our mouths. Of course, I had the small urge to buy a cake mix since it would be so much easier. Yes, even I have those moments. After all this cake requires a DOZEN egg whites. That seems a bit daunting, no? But I knew that when I made this cake from scratch, it would not taste of overwhelming sugary sweetness, nor have a chemical aftertaste and it’s softness would be due to my elbow grease and the 100% organic egg whites which were whipped to oblivion, not any preservatives. I may not be a baker who has converted yet to all agave and natural sweeteners, (although I am giving it some sincere thought) but I am a mom and baker who has decided that having complete control over what goes into my food is important to me. Knowing my homemade baked goods have so much goodness and so little fakeness baked into them makes me feel proud. Of course, I am a true believer in that if each of us just does the best we can on any given day with everything from parenting, to providing healthy meals, to preserving the environment then we are doing enough. No one is perfect, and we all just have to make our own priorities. So no judgement here folks, but just a nudge from me in the homemade direction. So as I am going to leave with you my good ol’ Better Homes and Gardens recipe for this fantastic Angel Food Cake and my strawberry puree, I will also include the offensive list of ingredients on the Betty Crocker cake mix so that hopefully, you will be convinced to bake a little bit more from scratch because it’s not about being Martha Stewart or Suzy Homemaker, but really about knowing what you are eating and making it worth every bite. For the cake: Remove upper racks from oven while cool and leave only lowest rack in the oven. Preheat your oven to 350 degrees Fahrenheit. DO NOT SPRAY COAT OR GREASE your 10 inch tube pan. That is very important. Bring egg whites to room temperature. SIFT (notice I rarely ask you to sift so when I do, please believe me that this step is IMPERATIVE) the powdered sugar and flour together THREE times. 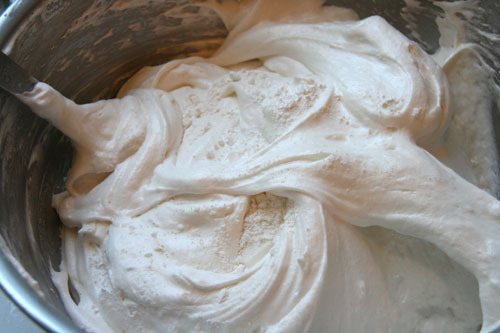 In a large bowl of a stand mixer (or hand beater), beat egg whites, cream of tartar, and vanilla on medium until soft peaks form (tips curl). Gradually add granulated sugar two tablespoons at a time, beating on high until stiff peaks form (tips are straight). 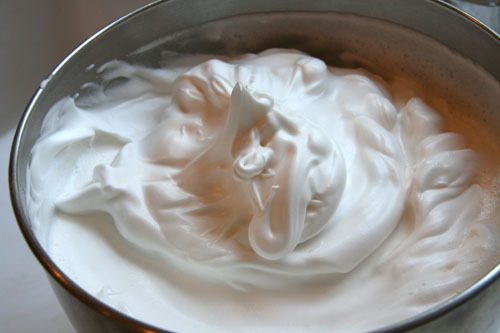 See photo above of stiff egg whites. Sift about 1/4 of the flour mixture over the beaten egg whites (see photo above). Fold in GENTLY with a rubber scraper, oh so gently. Folding requires a light touch and you use your rubber scraper at the bottom of the batter first and gently bring the bottom batter to the top and repeat until the ingredient disappears. Repeat until the flour mixture is all incorporated into the batter. See photo. Pour into UNGREASED tube pan. Bake on the lowest rack for 45-55 minutes or until golden and top springs back when lightly pressed. Toothpick should come out clean as well. Immediately invert the cake (leave in pan); cool thoroughly. 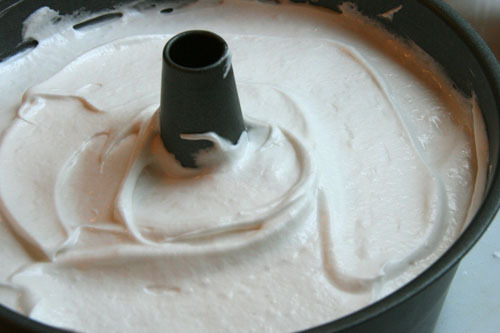 Loosen the sides of the cake from pan; remove cake. For the puree: Simply defrost your berries and puree them in a blender on high until a silky consistency. Add the sugar and blend again. Serve with cake. Other great additions to serve alongside the cake: Chocolate sauce, ice cream, any fresh fruit or fruit puree. Or make it tropical and grill some pineapple slices, toast some coconut and pour 1 tablespoon of rum over the pineapple slice that is served atop a slice of cake. Sprinkle with the coconut. Categories: Cakes | Tags: angel food cake, from scratch, homemade angel food cake, strawberry puree | Permalink. Your cake looks so lovely. I think it’s great you didn’t use a cake mix. Everything taste better from scratch. As always bravo. Oh Geni, I would take your cake and eat it with pleasure..looks fantastic and it is million times better because it is homemade! Wonderful photos and awesome recipe!!!! Im all about not eating the crap in the stores that has all those shady ingredients. Besides, homemade is always better. Im glad you posted this recipe. I had forgotten about angel food cake. Its so good, but you dont ever see it anywhere anymore. I need to remember to make it sometime. What a perfect low fat dessert. It looks delicious! 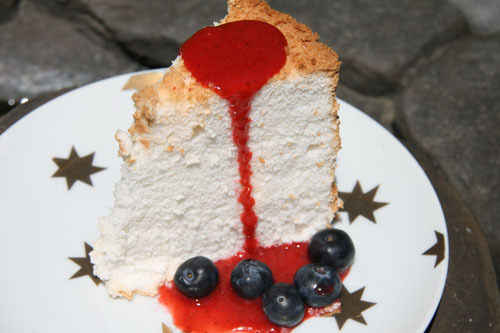 Angel Food Cake is one of my favourites! It was always my birthday cake request as a kid. We’d have it covered with whipped cream and crushed Crispy Crunch chocolate bars. I loved it sooo much! I will have to try it that way! Geni, this is fabulous! I can’t wait to try this. I have always wondered how difficult an angel food cake would be to do form scratch – I think it is – WAS the only not from scratch baking I do. And I too always wanted to jump into its spongy splendor! So glad to have a fellow Angel Food cake as landing day dreamer. Hip or not, I love angel food cakes…especially loaded up with fruit in the summer months 🙂 Yours looks wonderful! Isn’t it wonderful how favorite recipes and food can bring us back in time and make memories seem so tangible? I love that. Thanks for sharing. Talk about the perfection! The angel food cake looks so fine and delightful! Looks a cross between a pavlova and the Filipino Brazo de Mercedes (http://angsarap.wordpress.com/2010/09/14/brazo-de-mercedes/). Love that strawberry puree touch to it. Leah, seeing how much you cook, i am sure you would not screw up the process. Two tricks: 1)Never crack your single egg into the big batch of eggs. I’m sure that hint is a no-brainer. 2)Sift until your arm feels numb. This cake is highly dependent on sifting and whipping the eggs to stiff peaks. Otherwise, it’s a very, very simple cake. Much better from scratch, it looks perfect! Angel Cake is a favorite here! Simple but so fantastic! I think it looks great! I like angel food cake, but never think to pick one up. You are so right about how store bought or box cakes taste manufactured. When I jumped on the baking train this last year, I have found that a lot of scratch recipes don’t take much longer than whipping it up from a box. I have been called “Betty Crocker” a lot because I prefer to bake from scratch. I guess for us in the foodie world it’s a form of therapy. I too am curious about all the yolks you had left, what did you do with them? Thanks for sharing and now I am jealous because I want a piece! I love gorgonzola cheese….sounds delish! You know Geni, Angel Food Cake is my absolute favorite but I had no idea how to make it. I am saving this recipe and making this one day with some fruit. You’re right though, people forget about this wonderful cake.. but I haven’t :). Wonderful post. Oh yum. I love angel food cake! oh WOW – this looks perfect! job well done! It’s amazingly beautiful!!!! I’ve always wanted to make one but I don’t have the pan. 😦 I only have a Bundt pan. You think it would work okay? Wow..you made angel cake at home.I mostly buy at stores and then deck up at home.The best part I like is that there’s no oil..keeps you slim..looking like an angel ..LOL! I’ve never had angel food cake (when I say that, I mean I’ve never had it homemade and something that didn’t come out of a packet), but if I made it, I’m wondering what to do with the 12 egg yolks? Oh my gosh! I’ve been wanting to make this forever but I don’t have the pan – I think it’s going on my birthday wish list! This is truly heavenly!!! It’s been years since I’ve made a homemade angel food cake…but you’ve reminding me of how simply stunning this cake it! And with gorgeous berries appearing at the market, this will make my dessert repertoire soon! Thank you! That angel food cake is straight out of heaven! It looks so light, airy and delicious, Geni! Wonderful photos and an even better recipe. Thanks for sharing! trust me i would lick the whole batter, so pretty is the cake, airy and beautiful texture! Thanks for stopping by blog and for ur words of appreciation, very happy to be on ur space! I wholeheartedly agree that we need to know what we are eating, feeding people or being fed with! I love angel food cakes, it was one of the first desserts I was introduced to when I moved to the South! Seeing this made me think of a family Angel food cake recipe that was given to me as a wedding gift. I will have to dig it out and try it this weekend. No worries about the blog catch up. Thanks for the info. on the coconut. It’s so beautiful and more natural looking. Yes, the tornadoes have been so bone chilling. I hate seeing all the destruction. I have never lived in an area that has them and just can’t imagine how horrible it must be to be hit by one let alone a tornado storm. Your angel food looks gloriously light and high with a fine texture. Magnificent. Have never used powdered sugar. Is that the secret? On a totally unrelated subject, I noticed you asked Nina about her coconut. I have no idea what she did but thought I would let you know you can buy shaved coconut that looks an awful lot like hers at Kroger. They have three kinds. Shaved, grated and shredded. I love the shaved for decorating but even more, I like to toast it and eat it like candy.